Inspired by the curves and texture of the organic and the function and craftsmanship of the industrial, Brander Design blends raw and reclaimed materials into contemporary surroundings in innovative ways. Brandner Design offers design, engineering, and fabrication services for all types of architectural elements, kitchens, stairs, doors, fireplaces, custom hardware, furniture, and wall decor. Brander Design is unique in its ability to produce the work it designs. Our diverse staff of skilled artisans and designers work with interior designers, architects, or private clients throughout the country to help achieve works that stand above the rest. Pulling design aesthetics from the Industrial Age by using remnants in abandoned mills, factories, bridges, and railways, Brander Design pays tribute to the old but with a modern sensibility. Every piece of furniture, architectural feature, and hardware is designed to maintain the essence of great American craftsmanship. Our 20,000 sq ft. main facility in Bozeman, MT is fully tooled in wood, steel, glass, and leather work. We are constantly seeking out new methods and unique materials to push the limits of design. We still maintain a satellite studio outside NYC and an office in Jackson Hole WY. 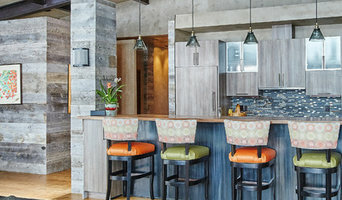 Four Corner Furniture has been handcrafting unique, rustic, reclaimed barnwood furniture since 2001. 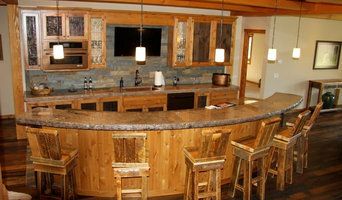 Our furniture is built on-site in Bozeman, MT, offering our customers competitive prices and superior service. In addition to our handcrafted barnwood furniture, our furniture warehouse also features mattresses, couches, local art, and more. We meticulously create, design, and produce beautiful handcrafted reclaimed barnwood furniture. Most reclaimed boards come from century old barns, grain elevators, textile mills and tobacco warehouses found in Montana and Wyoming. Our furniture is distinguished by the rich and rugged character of reclaimed barnwood, blended with a traditional and modern twist of incorporated industrial metals and recycled tin. All our select wood is beautifully aged, coupled with the refined lines, and natural character marks from saw markings and nail hole abrasions made decades ago, giving our furniture an “elegant rustic” charm. Our furniture has been featured in numerous homes and resorts across the country. You can be confident your furniture is being produced by industry experts. Sanctuary Interior Design is a full-service residential and commercial interior design firm offering a wide variety of services to fit any project. From new construction to simple design consultation, we can provide you with as little or as much help as you need. Principal designer, Sophia’s Cok's two greatest passions in life, design and people, are mixed perfectly in the art of interior design. She hopes through client relationships and her keen design sense, she can provide life giving spaces and environments that can be enjoyed for years to come. Sophia strongly believes “Good Design is Never Outdated”. MFGR Designs is a diverse design + production team that produces experientially rich responses for built environments, landscapes, and interiors. Our team of highly talented designers and fabricators can help you create any component of your home from dining room chairs, stairways, or your whole home. Three members of our team have Graduate degrees in Architecture from Montana State University while also having years of fabrication experience. These attributes help us serve you on a variety of scales. Give us a call today for your free design consultation. With 15 years of furniture making experience, Mortise + Tenon Woodworks is your one-stop-shop for all your custom, rustic furniture needs. Utilizing reclaimed barnwood structures from around the state of Montana, we are known for quality craftsmanship and attention to detail. From hand chiseled edges to handcrafted drawers with dovetail joints, our work is recognized as first class Montana woodworking. 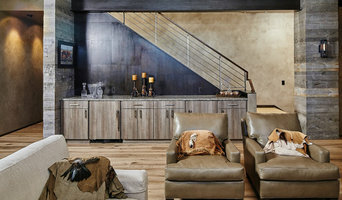 Our work is currently on display in our showroom located in Bozeman, Montana. Customized, heirloom & artisan quality furniture. Hand made, custom designed furniture to suite any clients needs. Building of custom furniture, interior accents and handrails from reclaimed material, as well as restoration and building cabins also from reclaimed materials. Our furniture and accents are very unique and somewhat funky. Custom furniture design and construction. Keeping budget in mind, we provide our clients with handcrafted custom doors, home decor and rustic furniture that is unmatched in quality. With an eye for unique design and your ideas, we can build whatever you desire. - Quality & Satisfaction Guaranteed - Installation Available Wood Products, Hardware, Design, Finish - All built to your specifications! Call today for a free estimate! Isaac Arms Studio Furniture is a custom design studio specializing in unique one of a kind sculptural furniture and limited production pieces. We also welcome custom steel and wood fabrication projects from architects, interior designers, and homeowners. After 20 years of dedicated service in the US Army, Todd decided to settle down with his family in Bozeman Montana. Due to the economic downturn in 2010, two local furniture manufacturers were forced to close their doors. Having over 20 years of experience building furniture for friends and family, Todd reviewed the failed business plans, made some adjustments and decided there was still a demand for handcrafted heirloom quality furniture. Due to Todd's optimistic, hardworking nature Black Timber Furniture Company was born and has since thrived. Black Timber Furniture Company of Montana is located just off of I-90 in Belgrade, Montana (10 miles west of Bozeman, Montana). The selection in our showroom is constantly changing, as each piece is made to order. We would be happy to give you a look into our workshop, to see the process we employ to create quality pieces of furniture. We pride ourselves on customer satisfaction, while maintining a priority of providing heirloom quality furniture that will last a lifetime. We consider it an honor to have our furniture in homes across America. Our furniture is made with pride in Montana by Montanans and the lumber we use is harvested from sustainable forests from the Midwest. Fry Steel and Wood creates one-of-kind commissioned furniture pieces as well as large scale installations and built-ins for residential and commercial spaces. Our company extracts CO2 from the air with the aim to reverse climate change. For a limited time only we are offering this highly unique planter made from recycled CO2. Take your time on any buying decisions. If contemporary is your style, don’t buy something traditional because it’s on sale. Many Montana home furnishers offer interior design consultations or room planning guides to get you started. Whether you decide to work with a home decor specialist or to become your own expert, it’s important not to rush the furniture-buying process. Visit plenty of Big Sky, MT showrooms and stores so you can feel comfortable with your purchase. Find furniture and accessories manufacturers, showrooms and retailers on Houzz. Narrow your search in the Professionals section of the website to Big Sky, MT furniture and accessories, then choose the nearest metro area for showrooms and retailers. Or you may want to look through Montana photos to find designs you like and contact the furniture manufacturers and showroom galleries directly.